I bought a Tivo about 6 months ago knowing that Tivo was planning on releasing the Tivo ToGo feature sometime during 2004. 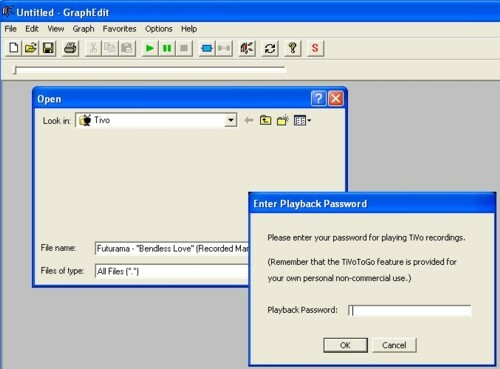 Well, as it turns out, it took until early 2005 to release this software update so you could transfer the shows/movies/programs you record on your Tivo to your home computer. 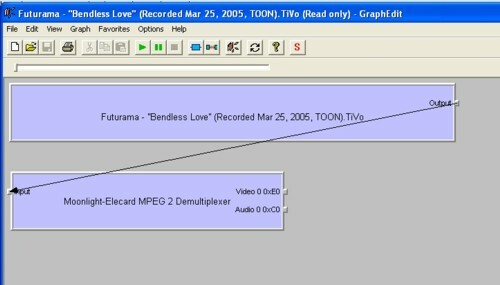 I had actually been using my VCR to transfer those shows to my computer prior to the release of the ToGo feature. It took a lot longer to accomplish, involved a lot more steps, but was doable. So, it kind of goes without saying that I was excited when Tivo finally got around to releasing this software update which meant I could transfer shows/movies/programs to my computer wirelessly then burn them onto a DVD for archiving. 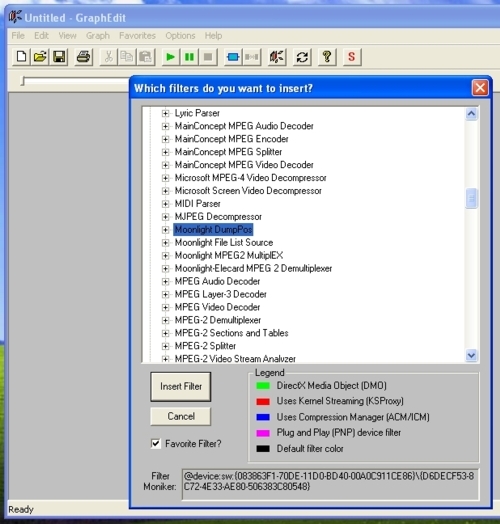 But, as it turns out, Tivo decided to encode the programs so you can only watch them on a computer with the Tivo Desktop server software installed. Or, if you want to pay an additional $50+ you could buy a program from Sonic that would remove the drm encoding and allow you to burn the programs to DVD. I’m cheap (even though I bought and use a Tivo) and have no interest in purchasing additional software just so I can already use the software I have (Nero and video editing software) to burn shows to DVDs. 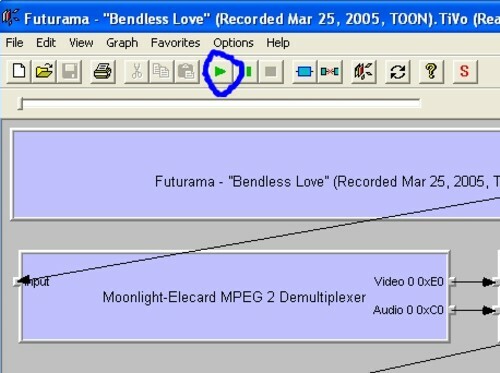 So, I searched around a bit on the internet after the ToGo feature finally made it onto my Tivo (in February 2005, almost a month after they started releasing the feature) and found a way to remove the drm encoding so I could edit the programs – remove the commercials – and burn them with the software I already own. While the process isn’t really that complicated, there are some specific steps that need to be taken and the directions on the site above aren’t perfectly clear. So, I figured I’d post my own directions with nifty pictures. 1) Of course you need to the Tivo desktop server software installed on your computer so you can transfer the shows. I’m not going to provide instructions on how to transfer programs to your computer as that is covered in detail by Tivo on their support site. 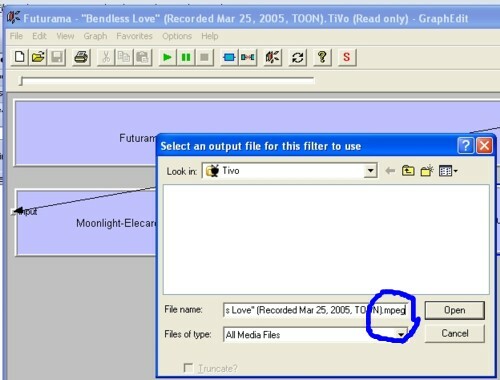 I will note, however, that Tivo shows are stored with the .TiVo file extension. Files with this file extension have the Tivo drm/encryption and whenever you try to open them to play them you will be prompted for a password (more on this below). 3) You’ll need to install both of these pieces of software. You should not need to change any of the default installation settings. 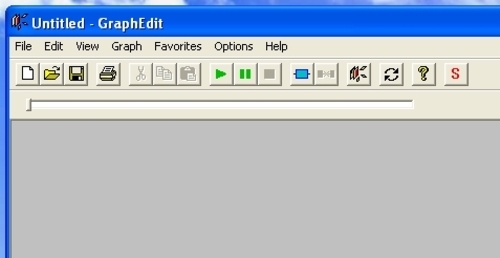 4) Once you’ve installed XMuxer and GraphEdit and have transferred a program to your computer, you’ll need to open GraphEdit. 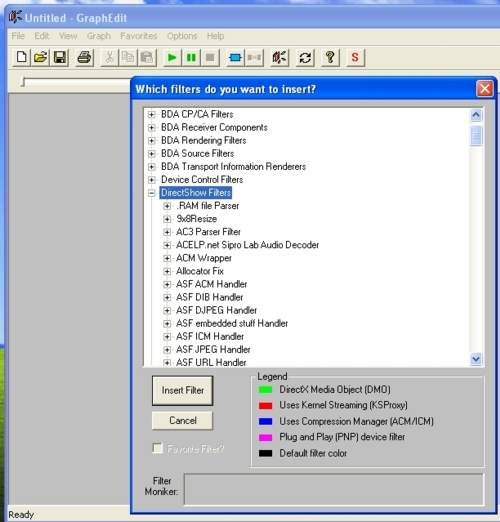 5) Inside GraphEdit you’ll want to open the program from which you want to remove the encryption/drm. 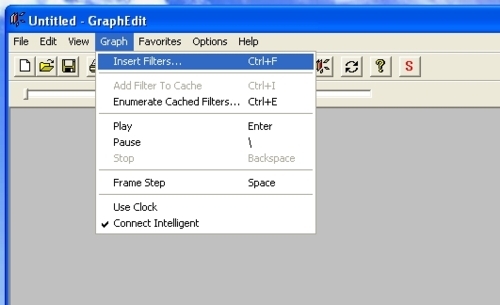 You’ll notice that the default file extension for opening files in GraphEdit is as a ‘Filter Graph’ (see picture below). 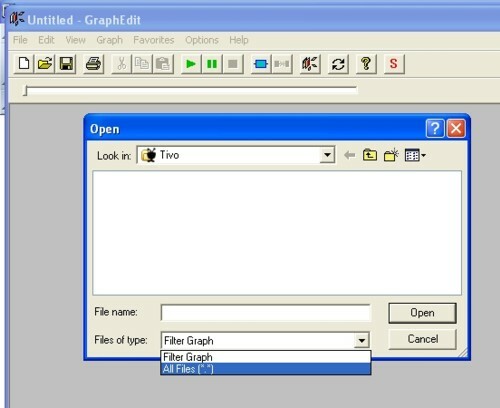 Change this to ‘All Files’ (see picture below). 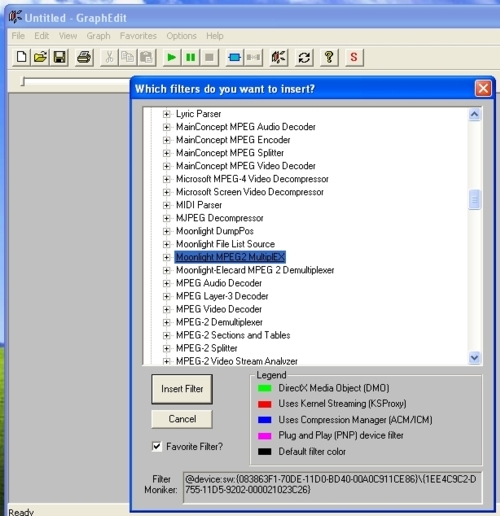 Then navigate to the folder where your TV file is stored. 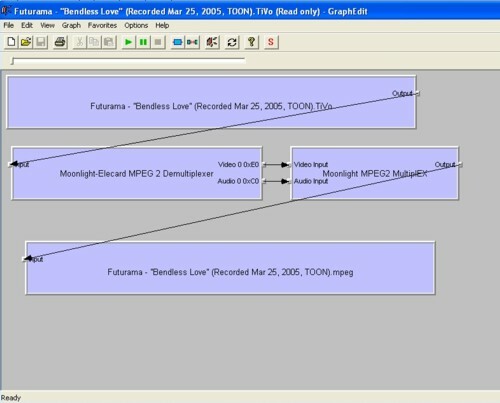 I don’t really claim any expertise on how this program functions, but if I’m not mistaken it basically is a graphical representation of the different pieces of software that are going to be involved in opening, decoding, and playing back the Tivo file. 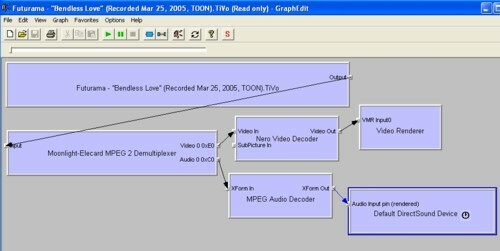 16) The resulting file should be DVD compliant. If not, Nero or another DVD creation program should do whatever is necessary to convert it. 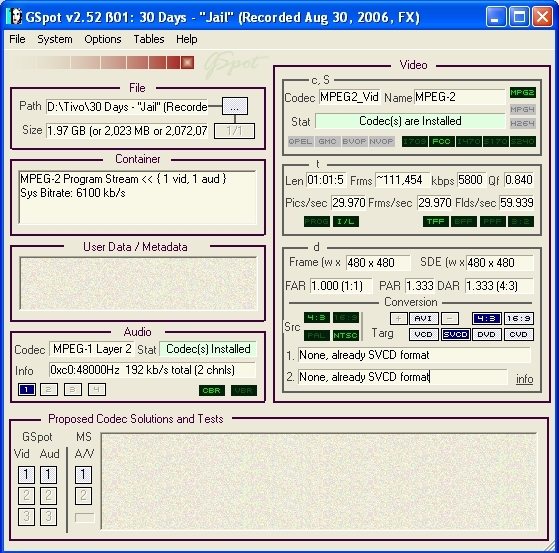 I’m not providing instructions on turning the actual file into a DVD, for that you’ll need additional software – so you can use the instructions that come with it. 17) One last thing… In trying this process I have found that the resulting video footage can be pretty crappy. I have had some TV shows turn out absolutely worthless with stuttering and frames freezing. However, bad video footage usually isn’t a problem. Where I usually do have a problem, and this is with almost every file, is the audio and video get out of synch (there’s usually a 20 frame lag between audio and video). I’m not sure what causes this, but I usually end up using a video editing program to cut out the commercials anyway, so I adjust the audio and video to get them resynched during that process then output them from there as DVD compatible mpeg files. If anyone has any suggestions as to why my audio and video are not synched after removing the drm/encryption, please let me know.